As summer hits its full stride, Van Natta Mechanical is bound to recieve calls from New Jersey and New York homeowners whose air conditioning systems are unable to keep up with the intense heat of July and August. There can be many different reasons why your home isn't getting as cool as it should be but one of the most common is low refrigerant in your central air conditioning system. If you have any doubts about the refrigerant in your system, you can give the experts at Van Natta a call and let us help you diagnose and solve your refrigerant issues or any other problems you might have with your air conditioning system. How Do You Know If Your Refrigerant is Running Low? The first step in fixing a problem with your air conditioner is diagnosing the problem. One of the most obvious signs is inconsistent cooling throughout your home. If you're noticing more warm spots than usual or you notice your vents blowing lukewarm or warm air, it's possible you have a refrigerant issue. This cooling inefficiency could also force your air conditioner to work harder to cool your home, causing more frequent breakdowns and a decrease in overall life expectancy. Another major problem that could be caused by low refrigerant is a frozen evaporator coil. The low pressure caused by the refrigerant issue can bring the temperature of your system down and cause the coil to freeze up. This will further reduce the power of your air conditioning and put a serious strain on your system. The most dangerous result of low refrigerant is the possibility of an overheated compressor. A fried compressor is an extremely expensive repair, and it might be worth it to replace the entire air conditioner. Only an air conditioning expert can help you make that assessment. While you might be able to diagnose inconsistent cooling and a hissing noise coming from your system, a frozen evaporator coil or an overheated compressor can only be properly diagnosed by an HVAC technician. You can trust the experts at Van Natta to open up your system and determine whether or not your refrigerant is low and how low it is. Why Is Your Refrigerant Low? The first issue to consider is why the refrigerant in your air conditioning system is running low. Both central and ductless air conditioning systems are closed loop systems so under normal circumstances, your refrigerant should not run out or get low. An HVAC system is not like a vehicle where it burns through gasoline as it runs. If one of our air conditioning experts determines that your refrigerant is low, there is most likely a leak in the system. If there's a leak in your refrigerant line, you may notice a hissing sound coming from the system. This is because there is a tremendous amount of pressure in the line and if there's a small opening, it will be similar to a balloon slowly deflating and make a similar sound. What Should You Do About Low Refrigerant? You have two options for dealing with low refrigerant and an HVAC technician will be able to recommend the best course of action for you. If you have an older system in which the refrigerant has never been replaced, you might be able to get away with simply having it recharged. It's likely that the leak is so small that you won't have to do another replacement and can get away with merely topping it off. 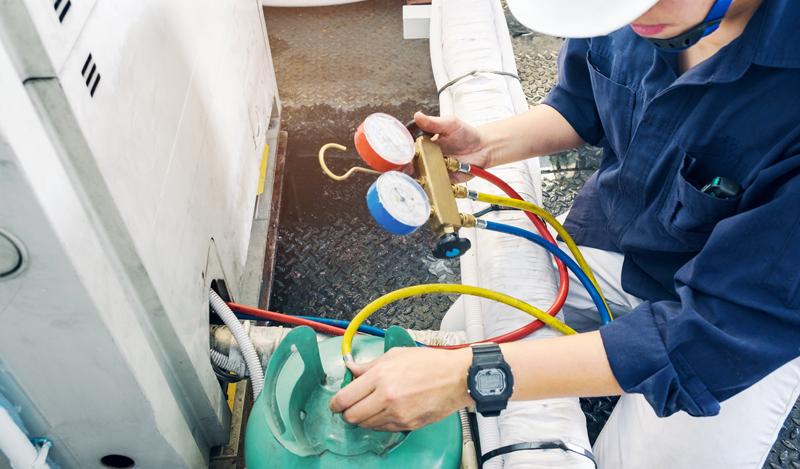 If it is dangerously low or you have had to fill it multiple times, your HVAC technician should perform some sort of leak test to determine the severity of the issue. There are several different types of leak tests. Because no two systems and homes are alike, a certified HVAC technician should determine which one is right for your system based on many different factors. Sometimes, it's sufficient to diagnose the issue with a device that detects refrigerant that has leaked outside of the system near the joints and coils. Other times a test where the entire system is evacuated and highly pressurized nitrogen is run through the system is necessary. Only a professional HVAC technician can determine which type of test is necessary for your system and your home. The experts at Van Natta Mechanical can assess your air conditioner and decide what tests to perform. If a technician determines your system has a leak, there are a couple different options you can pursue. If you have a leak in a visible joint or valve, it can probably be repaired quickly and easily. If the leak is in the evaporator or condenser coil, you could be looking at a more difficult and costly repair. Severity of the leak should be a factor but age and type of HVAC system should also enter into the equation. If you have a newer system with a more environmentally friendly R410a refrigerant, it's probably in your best interest to have the repair done. If you have an older system with R22 refrigerant (Freon), you might want to consider replacing the entire system. Freon is no longer allowed to be manufactured under EPA regulations, and the price will continue to go up, making repair less and less cost effective. Replacing your entire system with a new energy efficient air conditioning system might be the best decision. As with most other things we've outlined, an HVAC professional is in the unique position of recommending your next course of action in this situation. If you think you might have an issue with your refrigerant, the Bergen, Rockland, and Passaic county air conditioning experts at Van Natta Mechanical can help! Whether you have a central air conditioning system or a ductless air conditioning system, we can diagnose and solve any problem you might have with your home's HVAC system including low refrigerant and refrigerant leaks. If you have other air conditioning and heating needs, you can also give us a call. We can stop by and take a look at your air conditioning system as we get into the dog days of summer because you don't want your system to break down on one of these hot days. We can fix some of the more complicated issues that may arise with your air conditioning system, heating system, or duct work and our comprehensive inspections will give you the peace of mind that your system is operating properly. We offer air conditioning system maintenance, repair, replacement, and installation in addition to spray foam insulation installation to keep cold air from escaping your home and reduce your energy bills. We currently have an air conditioning special for New Jersey and New York homeowners for an air conditioning system installation. Now is the perfect time to have your air conditioning or heating system inspected by a Van Natta Mechanical air conditioning expert so contact Van Natta or give us a call today at 201-391-3700.